Its Friday (yippee!) - time for another Steal this Idea* feature - a tiny show of appreciation for a well executed tutorial. Today's feature is a great example of a "DUH!" kind of tutorial that seems so perfectly simple, yet Ive never seen it done before. So what is it? This paper cone Dahlia wreath. It looks stunning in black (hello halloweeen!) but it could be done in any color with the same gorgeous result. Count me in on making at least one of these this year. I think it would be even more amazing really huge like the ever popular feather juju hats. I found it on pinterest, with a link to a site that appears to feature other peoples work without credit. (NO NO NO!!) I did a google search on the image and still can't find its original source. Does anyone whose mind this idea sprung from? Please let me know so I can attribute properly here and pin directly. I totally pinned that, too. Great idea to make them for halloween. Hope you're feeling good, mama! I love this!! The possibilities are endless! Super cute in black. I've seen it in white in shabby chic decor, never black. This is totally awesomeI will need to be making one. I kind of fell off the face of the earth with some personal stuff so thank you for the happy birthday and I am very late in CONGRATULATIONS on your latest addition to the Limestone household! I remember some blogger doing this with pages from an old book about three or four years ago. I feel like it spread from blog to blog back then and faded out. Just a few weeks ago, I was at a vineyard that had a few hanging over a fireplace and since them, I've been noticing them creeping back. I wish I remember where I first saw it! I love this idea, since we were considering a juju hat but can't justify the cost. This idea is spawning a similar idea with feathers, but I love this Dahlia. This is so pretty. I think I will definitely have to make one. It would probably also be gorgeous in a nice burgundy for Christmas. Ooo and I wonder how it would look if you used felt instead of paper. Then it might be easier to reuse since you wouldn't have to worry as much about it getting crushed and the paper all crinkly. Similar but not the source of this image (unless Im missing it). Yes I posted that one years ago but this one has a slightly different look. Maybe its just the material but this treatment looks a lot more refined than the book pages one to me. First one similar but not the source of this image (unless Im missing it) and the second site is the one I mentioned that links to other peoples work without credit. Definitely a no-no. You would think in a digital age it would be so simple to find the original source of this image but I'm having no luck at all. I LOVE this but I am in need of more information to make my own. I'm a little slow i guess! Do you use full sheets of paper ar cut smaller, are they square or rectangle, is it card stock or regular paper? i really want to make one but I am not good without instructions! HELP please! Sorry but I have absolutely no clue. Part of the reason why I wanted to find the original source but haven't had any luck so far. I guess Ill have to try myself and share how I did it at some point. This is fabulous! I need to give this a try. I haven't had any luck yet either finding the source. There is one clue in the photo, however. The newspaper that the wreath is on is written in English. 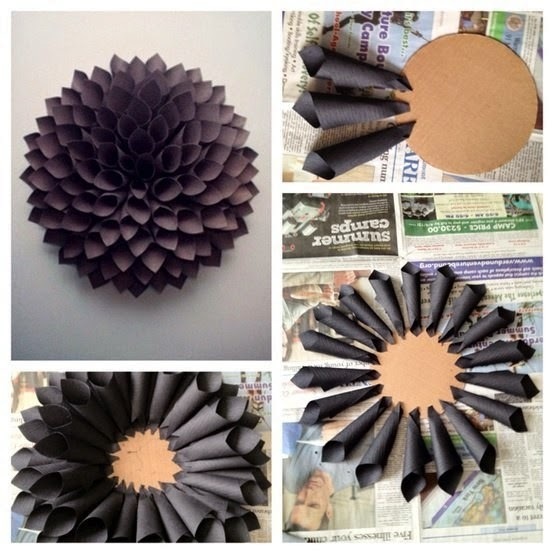 http://longlastingthoughts.blogspot.com/2012/09/flower-decorative-with-paper-and.html I found this just now. I'm not certain it's the original though. Considering that post was from yesterday, I think it's safe to say its not the original. That blog author explains the project like its their own which is shameful! Have you found the "how to do" this dahlia? Many years ago I used to make this and paint it GOLD and put a small lil' wreath in the middle, everyone over this. I used the long IBM cards that they used to send our bills on..
NotMartha did a tutorial for a felt version. I made a few and they were spectacular. What size are the paper petals? I just can't sem to make a nice shaped cone.